Caution - Insert a filler panel into an empty modular system slot within 60 seconds of server module removal to ensure proper chassis cooling. Caution - Hold the server module firmly with both hands so that you do not drop it. The server module can weighs as much as 20 pounds (9.0 kg). (If needed) Replace the cover. (If needed) Remove the rear connector cover from the server module before inserting it in the modular system. Remove a filler panel from the modular system chassis slot you intend to use. When the modular system is operating, you must fill every slot with a filler panel or a server module within 60 seconds. Hold the server module in a vertical position so that both ejector levers are on the right (panel 1). Slide the server module into the chassis (panel 2). 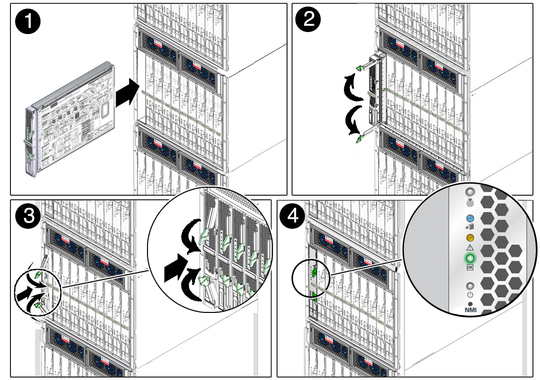 Close both latches simultaneously, locking the server module in the modular system chassis (panel 3). The front panel LEDs blink three times, then the green OK LED on the front panel blinks for a few minutes. Oracle ILOM is initialized on the server module SP and ready to use, but the server module host is not started. Start the server module host. See Power On the Host (Oracle ILOM).